Patterns is the ultimate tool for working with regular expressions. Build great patterns quickly and effortlessly with regex syntax highlighting, live match view, replace mode, built-in quick reference, and much more. Whether you're a seasoned regex wizard or new to regex, Patterns is the only tool you'll ever need. Regular expression syntax highlighting makes it easy to see how your pattern is interpreted by the regex engine. No more confusion about what needs to be escaped. The Matches view lets you inspect all matches and captured text produced by your regex, alongside your search text. Clicking on a match or group highlights both the matched search text and the specific portion of your regex that produced the match or capture. See matches, replacements, and filter results in real time while you edit your pattern. Use the Copy Code feature to quickly export your pattern for use in a number of different programming languages. 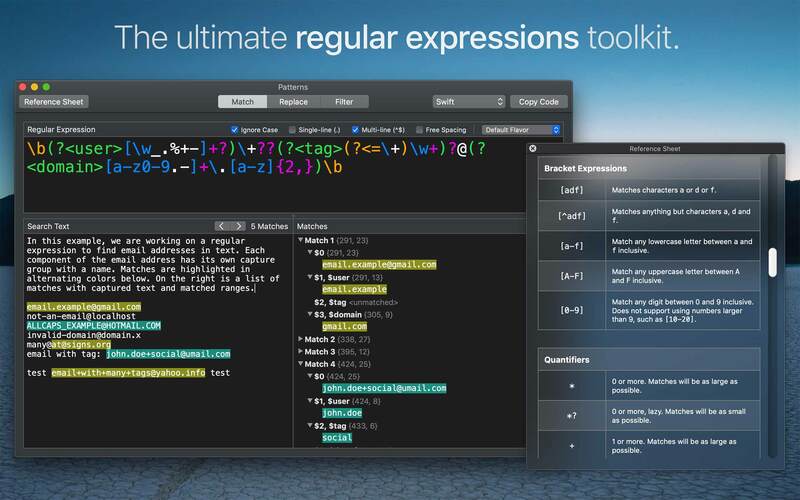 The built-in regular expression quick reference sheet helps you learn and expand your knowledge of regex syntax. Customize the regex engine for different regex "flavors". Supported flavors are: Oniguruma, POSIX Basic (BRE), POSIX Extended (ERE), Perl (PCRE), emacs, Java, Ruby, bash, grep, and sed. If you have a syntax error in your pattern, a helpful error message lets you know the exact nature of the error.